2 Population without double counting: residents of multiple communes (e.g., students and military personnel) only counted once. Bayeux is a commune. It is found in the region Basse-Normandie in the Calvados department in the Northwest of France. The town is famous for its tapestry. It is one of the oldest complete tapestries in the world. The inhabitants are called Bajocasses ou Bayeusains. Bayeux is a sous-préfecture of the Calvados department. A Gules tincture with a Golden leopard and the letters B and X.
Bayeux is the capital of the Bessin which was called Bajocasses before. Bessin was a province of France before the French Revolution. The name of the city comes from the Celtic tribe which lived in the Bajocasses region. The Renaissance didn't really mark the town. The most notable building from that period is the Saint-Patrice Church. It was built between 1544 and 1548. Bayeux was the first city in France to be liberated after the Battle of Normandy. On 16 June 1944, General Charles de Gaulle made his first major speech in Bayeux. The buildings weren't damaged much during the Battle of Normandy as the German forces were defending Caen at the same time. The Bayeux War Cemetery is the largest British cemetery dating from the Second World War in France. There are 4648 graves: 3935 are British and 466 are German. Bayeux is seven kilometres from the English Channel and the D-Day Landing Beaches. It is about 30 kilometres northwest of Caen. The town's elevation varies from 32 to 67 metres (with an average of 46 metres). The river Aure passes through it. \_ year of the maximum T°. \_ year of the minimum T°. La Bayeux Train station is on the Paris-Saint-Lazare>Cherbourg line. The TER line is from Caen to Rennes. The Bybus goes around the town and to the communes of Saint-Martin-des-Entrées and Saint-Vigor-le-Grand. There is one main line (Chojnice / St-Martin-des-Entrées) and three minor one's toward the different districts. The Bus verts invented by the Conseil général is a way to get to the surrounding communes (lines 30, 70, 71, 72, 73, 74). 3000 parking spaces in the town center make it an easy place to park. Furthermore, most car parks are free. The By-pass is Bayeux's ring road. The first part was built after the Battle of Normandy by British soldiers. The roads in the town center were too narrow for the Tanks to get through. The By-pass used to be the Route nationale 13 until a motorway was built (A13 autoroute). The closest airport is in Caen (21 km away) and the closest ferry to England (32 km away) leaves in Ouistreham. 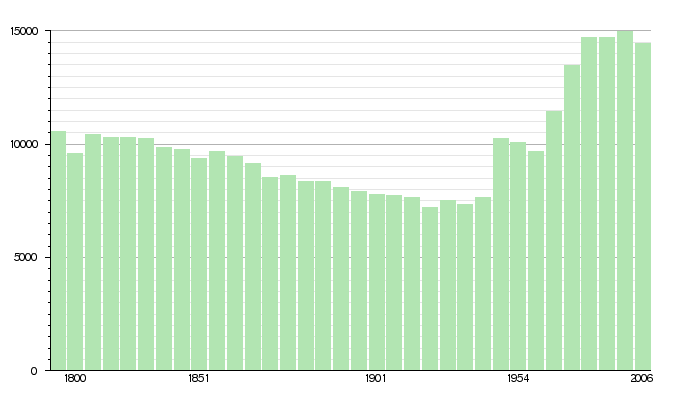 For all dates after 1962, the population count here counts every person only once, per the INSEE. Bayeux is the fourth biggest town in Calvados by population. The three biggest are Caen, Hérouville-Saint-Clair and Lisieux. 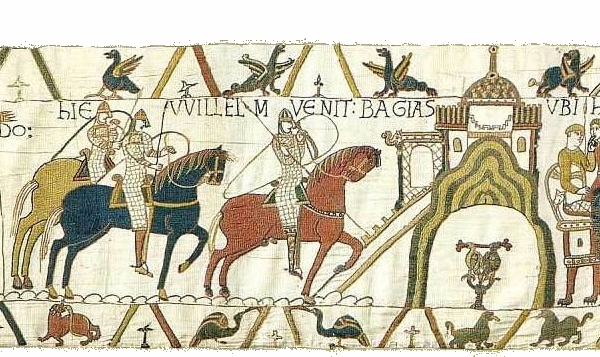 Bayeux Facts for Kids. Kiddle Encyclopedia.